Since most ISP companies use spam filters, please add our email address to your list of Approved Senders or Contacts. This process is commonly known as Whitelisting. If you do not see an email from us in your inbox (due to the overzealous filtering by ISPs) our email may have been sent to your spam folder. Please open your spam folder look for it there, open it and mark it as "not spam". Refer to the list below for your ISP or your Email Client and find corresponding section below to see how to add our email address to the "Approved" or "Safe" Senders list. If not listed here, you may try GOOGLE to find the instructions for your specific service or version. Search on Whitelist, Safe Senders or Approved Senders for your emaiil service provider. You may also wish to GOOGLE to find more recent information for your specific service provider, as these can change with new versions and we cannot keep up with them all! We have found instructions for some of the more popular email service providers, email clients, and spam filters that you may find helpful. To make sure your email gets delivered to your AOL inbox, you must add our email address to your Address Book or Custom Sender List. Click the ’Spam Controls’ link on the lower right side of your inbox screen. When the ’Mail & Spam Controls’ box appears, click the ’Custom sender list’ link. Click on Settings and expand the menu. Add an asterisk (*) to the Safe Sender List. All e-mails sent to the Xplornet e-mail address will now be sent to the Inbox. The Safe Sender List overrules the Blocked Sender List. So if you bypass the Spam filter by adding the * to the Safe Sender List, even if you add addresses or domains to the Blocked Sender List, they will continue to come to the inbox. If a customer creates a Filter to direct mail that meets certain criteria to the Spam folder, it will be filtered accordingly. In Yahoo! Mail, log into your email account and follow these steps to add us to your address book. This ensures that you never miss out on any of our emails! On the main screen, select the ’Add’ link next to the Contacts item, on the left hand side of the page. Use the ’Not Spam’ button in your Bulk folder. On the main screen, select the ’Contacts’ option in the left hand navigation menu. A confirmation will appear at the top saying that the contact has been added. In Webmail for Shaw, log into your email account and follow these steps to add us to your safe list and to ensure that our emails are not automatically deleted. This ensures that you never miss out on any of our emails! Once you see our email listed in your personal address book, it means that we’ve been white listed, and will help ensure that you continue to receive our emails straight to your inbox. On this page, you have the ability to adjust your spam filter settings. Select ’Disable Junk Email Filtering’so no emails are blocked or deleted automatically. Using www.bell.ca/ webmail sign in to your Sympatico account. On the Sympatico web page, click on the Options tab at the top of the page. Select the ’More Options’ link at the bottom of the drop down menu. 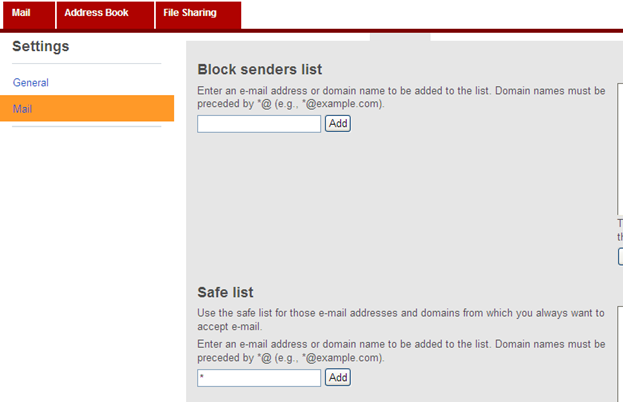 On the new page, under ’Junk e-mail’ click the ’Safe and Blocked Senders’ link. In Rogers Mail, log into your email account and follow these steps to add us to your address book. This ensures that you never miss out on any of our emails! to your address book and confirm that our newsletter is not spam by reporting so in Telus Webmail. Click on ’Address list’ on the sidebar menu. Open and log into TELUS Webmail. Select the email(s) you would like to report. Click on the ’Not Spam’ button above the email(s). The message will be automatically reported as Not Spam. On this screen, in the Preferences tab, select the ’Junk E-Mail’ button. Give this rule a name such as Newsletters from St. Albert Curling Club. From the actions, select "Move message" to mailbox "Inbox"
Make sure ’Accept Mail From This Address’ is selected under Receiving Options. Uncheck ’Display in People Picker’ under Other options. Check your ’Probably Spam’ folder. Click the ’Move to Inbox and Mark as Not Spam’ button. Select your ’Address Book’ and click on "Check all"
Click Add under ’Known Good Senders and Recipients’. Choose ’Full Email Address’ under Address Type. Then ’Manage Friends List’ from either the Spam Inspector toolbar or from the Outlook menu. Make sure Email is selected under ’Add a New Friend’. Click ’Add to Whitelist’ from the menu.